HIGHEST QUALITY GUARANTEED! In business since 2005, our engines are fully rebuild-able with all parts available. 4HP Gas Engine with Recoil Start: Perfect for Go karts, log splitters, edgers, and various residential and commercial applications! At Carroll Stream, we manufacture the highest-quality 2.5-horsepower motors to replace a wide range of gas-powered equipment. This powerful 2.5-HP gas engine with recoil start is perfect for commercial and residential equipment, including tillers and edgers, as well as go-karts and mini-bikes. This lightweight motor weighs only 20 pounds and delivers 2.3 ft. lbs. of torque at 3,240 RMP. The four-bolt pattern allows for fast and sturdy installation to deliver exceptional power and unparalleled performance. This motor is designed to replace a wide range of engine brands and deliver all the power you need to get the job done quickly. The Carroll Stream 2.5-horsepower small motor is powerful, versatile and built to withstand the rugged treatment that's common with industrial outdoor applications. Buy now to take advantage of our competitive prices, with fast shipping on all orders. At Carroll, Stream, we manufacture the highest-quality 1.5-horsepower motors to replace your old or worn-out motors. This powerful 1.5-HP gas engine with recoil start is perfect for commercial and residential equipment, including tillers, cultivators, trimmers, augers, motorized bicycles and water pumps, as well as a wide range of agricultural applications. This compact motor weighs only 9.3 pounds and comes with an electronic ignition system that allows for fast, easy starts every time. Our 1.5-horsepower small engine can fit into compact places and mounts using a sturdy four-bolt system. The Carroll Stream 1.5-horsepower motor is powerful, versatile and built to last. This reliable motor is designed to withstand rugged treatment and outlast the competition for your most important applications. Buy now to take advantage of our competitive prices, with fast shipping on all orders. This 5.5 HP gas engine is excellent for new or replacement applications, and is excellent quality. This small gas engine is perfect as replacement small engines for go karts, log splitters, mini bikes, and various residential and commercial applications. Check out our 6.5 horsepower replacement motor for go karts, mini bikes, and plenty of other residential, commercial, and industrial applications. This powerful and compact motor comes with recoil start with the option for electric start and electronic ignition that ensure fast, easy starts each and every time! Our 6.5 horsepower engine is lightweight at 33 pounds with durable construction that includes a cast iron sleeve and keyed – straight shaft. The low oil shutdown mechanism ensures your motor won’t burn up in the event that the motor becomes low on oil which helps keep the motor from overheating. Our 6.5 horsepower motor is the perfect replacement for your 5.5 horsepower engines and this motor is compatible with Lifan engine parts. Order the 6.5 horsepower Carroll Stream motor now to take advantage of our competitive prices and fast shipping on all orders or give us a call at 1-888-208-2088 to speak with our team of experts standing by to help you find the perfect motor that meets all of your needs. 7HP Gas Engine, Recoil Start. This 7 Horsepower Engine is Perfect for Go Karts, Mini Bikes, and various Industrial and Commercial Uses. 6.5HP Gas Engine, Recoil Start. This 6.5 Horsepower Engine is Perfect for Go Karts, Mini Bikes, and various Industrial and Commercial Uses. Our 6.5 HP Gas Engine with Electric and Recoil Pull Start (B) is excellent quality. 6.5 HP motor perfect for Go Karts, Mini Bikes, and various Industrial and Commercial Uses. Our 5.5 HP Gas Engine with Electric and Recoil Pull Start (B) is excellent quality. 5.5 HP motor perfect for Go Karts, Mini Bikes, and various Industrial and Commercial Uses. At Carroll Stream, we sell the 6.5-horsepower Kohler engine designed for go-karts and mini-bikes, log splitters and countless other industrial and commercial applications. The innovative Kohler 2000 Series 6.5-HP motor weighs only 29 pounds and packs 10.7 ft. lbs. of torque into this powerful and compact motor. The recoil pull start guarantees fast and easy starts every time! 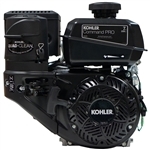 The Kohler 6.5-HP motor delivers unparalleled power for its size and is the perfect replacement for various Briggs & Stratton, Honda, and other top motor brands. Whether you’re rebuilding your mower or your industrial equipment, this motor has the power and features you need to get the job done. The Kohler 2000 Series 6.5-horsepower motor is versatile, powerful and built to withstand the most rugged jobs. Order the Kohler 2000 Series motor now to take advantage of our competitive prices, with fast shipping on all orders. 9 HP Gas Engine, Recoil Start. This small gas engine is perfect for Go Karts, Mini Bikes, and various Industrial and Commercial Uses. Briggs & Stratton 550 Series Gas Engine, Recoil Start. B&S Engine Perfect for Go Karts, Mini Bikes, and various Industrial and Commercial Uses. 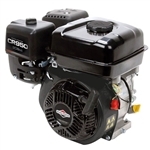 At Carroll Stream, we sell the Briggs & Stratton 950 Series 4-stroke motor. The 950 Series gas engine comes with a recoil start and 4-stroke system that delivers all the power you need to power your go-karts and mini-bikes as well as all kinds of industrial and commercial equipment. This powerful motor weighs only 39 pounds and provides 9.5 ft. lbs. of torque. This 208cc Briggs & Stratton motor comes with the muffler and fuel tank and has a four-bolt configuration that allows for fast and sturdy installation. The Briggs & Stratton 950 Series motor is the perfect replacement for a wide range of brands, with endless applications. The Briggs & Stratton 950 Series gas engine is versatile, powerful and built to last. This durable motor is designed for rugged use and can handle your toughest jobs. Order now to take advantage of our competitive prices, with fast shipping on all orders. 6.75 Ft Lbs. Gross Torque Gas Engine, Electric Start, Perfect for Riding Mowers, and various Industrial and Commercial Uses. This is a direct replacement for the old staggered wheel , 2 cycle Lawnboy mowers. 6.5HP Gas Engine, Recoil Start, Perfect for Mixers, or any other application where a 6:1 gear reduction motor is needed. 11HP Gas Engine, Recoil Start, Perfect for Industrial and Commercial Uses. 13HP Gas Engine, Recoil Start. 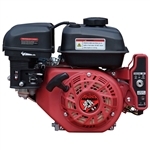 13 HP Engine Perfect for Go Karts, Mini Bikes, Air Compressors, Pressure Washers, Sawmills, Tractors, Golf Carts, and various Industrial and Commercial Uses. Briggs & Stratton 1150 Series Gas Engine, Recoil Start. 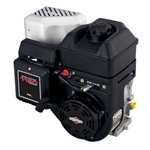 Briggs small engine is Perfect for Go Karts, Mini Bikes, and various Industrial and Commercial Uses. Honda GX160 Engine, Recoil Start, Perfect for Go Karts, Mini Bikes, and various Industrial and Commercial Uses. Honda GX120 Gas Engine, Recoil Start, Perfect for Go Karts, Mini Bikes, and various Industrial and Commercial Uses. This Kohler 7HP gasoline engine features a 4-cycle, slant cylinder design, with a cast iron cylinder bore and overhead valve for easy access. The Quad-Clean™ 4-stage air filtration system ensures only clean air enters the engine for maximum power and life of the engine. In addition, this small Kohler engine is backed by a 3 year commercial warranty. 16 HP Gas Engine, Recoil Start, Perfect for Go Karts, Mini Bikes, Air Compressors, Pressure Washers, Sawmills, Tractors, Golf Carts, and various Industrial and Commercial Uses. This 16 HP gasoline engine is available today! Honda GX200 Gas Engine, Recoil Start, Perfect for Go Karts, Mini Bikes, and various Industrial and Commercial Uses. Order this Honda small engine for sale and put it to good use! This forced air-cooled 4-cycle engine features pressurized lubrication, an internally vented carburetor, dual element air cleaner, zone start, 1.8L fuel tank, oil filter, KAI, choke, engine brake and a ball bearing supported crankshaft. This forced air-cooled 4-cycle engine features pressurized lubrication, an internally vented carburetor, dual element air cleaner, zone start, 1.8L fuel tank, oil filter, KAI, choke, and a ball bearing supported crankshaft. This forced air-cooled 4-cycle engine features an internally vented carburetor, dual element air cleaner, zone start, 1.8L fuel tank, primer, fixed throttle, engine brake and a ball bearing supported crankshaft. 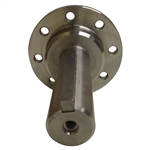 Commonly used on Ariens, Billy Goat, Eastman, MTD, and Kawasaki power products. This forced air-cooled 4-cycle engine features an internally vented carburetor, dual element air cleaner, 1.8L, choke and a ball bearing supported crankshaft.